Whether you're looking for ways to enhance your client experience, or you've been tasked with finding welcome gifts for a special event, it's time to breathe a sigh of relief! As a full-service custom gifting studio, MEMENTO & MUSE streamlines the gift-giving process from concept to creation to delivery...freeing you to focus your time and energy on the rest of your business' needs. Your gifts will be thoughtfully designed to make a memorable impact, and can be artfully packaged to reflect your corporate or event branding. To get started, please share a bit about what you're looking for in the Custom Gifting Questionnaire below, and I'll be in touch! Are you looking to make a more meaningful impact with your client appreciation program or event welcome gifts, but don't have a lot of time to spare? Whether it's throughout the year or just for the holidays, let MEMENTO & MUSE handle your gifting to-do list. To learn more, please fill out the questionnaire below, or sign up for a complimentary gifting consultation. Your website will help me get an idea of your brand values/aesthetics. Which corporate & event services would you like to learn more about? What will be the specific purpose of these gifts? Is there a particular theme or brand color palette you'd like your gifts to reflect? How many gifts do you need? What is your per-recipient budget (not including shipping or tax)? Local delivery is complimentary for certain areas; shipping additional. What is your business mailing address? Thank you for taking the time to fill out your custom gifting questionnaire. If you haven't already done so, please set up your initial complimentary consultation by selecting your preferred appointment time here. I look forward to meeting you! Your per-gift investment includes A) the gift items themselves, B) artisanal gift packaging designed to complement your brand or event/occasion, C) design and product sourcing for 2 unique gift concepts, and D) handcrafted assembly. Sales tax, shipping and/or delivery charges (if applicable) are separate. If you prefer completely separate gift designs for each of your tiers with no product overlapping, please note minimum quantity (see above) will apply for each separate design. 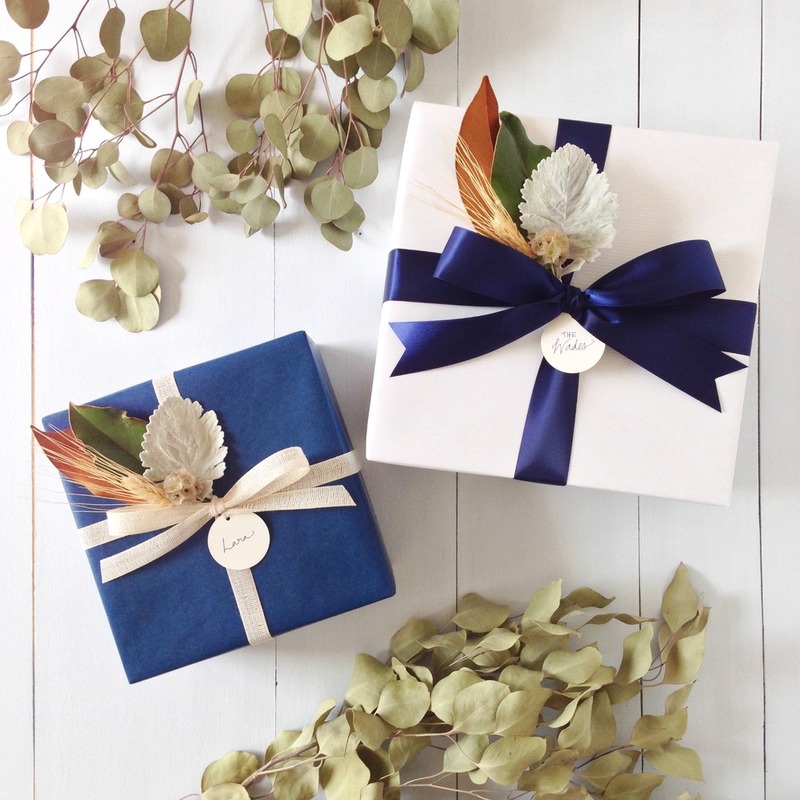 Your corporate or event branding can be reflected in your artisanal gift packaging in a wide variety of ways, from color palettes to imprinted logos to custom gift tags. As part of your gift design process, we'll work with you to craft a custom look that best meets your marketing goals and budget. White Label Packaging: For most custom designs, a discreet card that says "Hand Selected For You By MEMENTO & MUSE" will be enclosed within each gift. However, if you prefer "white label" packaging with no reference to Memento & Muse, you may request this for an additional fee. Direct-to-Recipient: You may choose to have your gifts shipped to your company, or directly to your clients/recipients. Shipping rates are dependent on gift design and destination. Local Clients: Pickup or delivery may be requested for the Triangle region of North Carolina; please inquire for details. Domestic vs. International: We ship gifts throughout the USA. Please note we do not currently offer international shipping. General order processing times are below; HOWEVER, please visit www.mementoandmuse.com/turnaround for the most current turnaround information. Non-Holiday Orders: Turnaround time will vary depending on the gift design and quantity needed. In general, please allow 5-6 weeks for design, production and delivery. End-of-Year Holiday Orders: Due to high demand for our services during the holiday gifting season, we strongly advise that you place your order by October each year (and *early* October for orders of 50+ gifts!). Reorders: For reorders of the same gift design as your initial order, turnaround times are generally closer to 3-4 weeks. For most gift designs, your promotional material/company greeting card/etc. can be included within your gift at no extra charge. You may also inquire about including your own already-purchased gift item within your custom gifts. A 60% deposit is required to reserve your spot in the Memento & Muse design and production calendar.